Come on down, Come on down to this American country fair and take your chances at unhooking the yellow rubber duckies. Enjoy the fun of the fairground display and range of cuddly characters on the reel board that can be connected to achieve handsome rewards and up to 15 free spins. Start your fun and come play onlines slots today! From the Developers at Playtech/Virtue Fusion we bring you Double Up Ducks. After purchasing Virtue Fusion a couple of years ago Playtech and Virtue have been working together to create some of the most forward-thinking slots games on the market. You may have already heard about these game giants, but they are certainly pushing the boundaries as you play online slots games. If you take a look at the image below you will be able to tell that the graphics on this game are absolutely superb. There are tonnes of games with great graphics but there’s something about this game that really sets it apart from the rest and props must be given to the developers for that. In a similar fashion to many other slots, this is a 5 reel, 3 row online slot game with a grand total of 25 variable paylines. If you’re feeling lucky and not looking for much of a risk bet placement starts at 10p and rises to a whopping £1000 per spin depending on how much of a daredevil you are. This game owes itself to a wonderful fairground theme and all the symbols reflect this, making it one of the best slots games one must not miss. Spin your way through 5 reels of stuff animals, fairground tickets, lollipops and helium-filled balloons. Land on the pink elephant and you’ve found one of the highest paying symbols on the game, land 5 and you’ll multiply your original stake by an absolutely huge 9500 times. In addition to this great feature, you can also use the pink elephant as a substitute for all symbols except the higher-ranked duck shooters. As far as slots promotions go, the elusive duck shooters symbol acts as your Scatter. These symbols have the freedom of the game board and can appear across any single payline. Large payouts should be expected when you match 2 of these guys but they truly show their worth one you enter the bonus rounds. 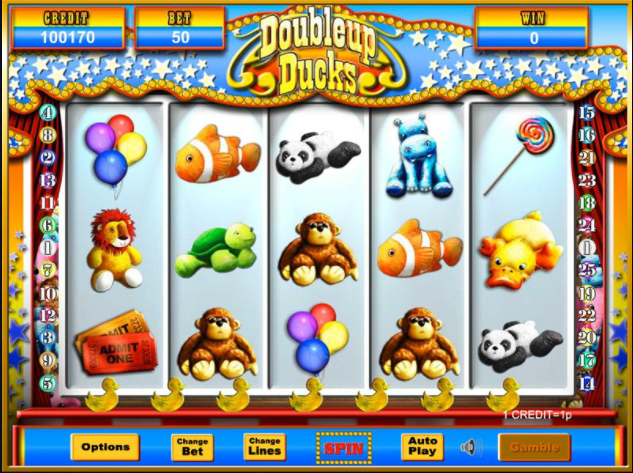 3 or more duck scatters results in 15 free spins, which is quite a generous offer. All payouts are tripled whenever you firing away in fairground free spin mode. If you’re one of the daredevils that were mentioned earlier in the descriptions then I’m happy to see you’ve come this far to experience the tenaciousness of the gamble feature. Click the gamble button and be greeted with 2 choices. It’s your standard double or nothing choice. Do you have to risk it all at the fairground? 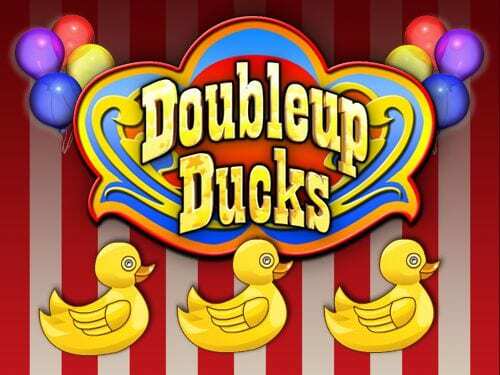 Double Up Ducks is a fresh and modern slot game that delivers everything you need. The developers at Playtech/Virtue Fusion have really pushed the boat out with this one and this is visible within the graphics. On top of this, there are some huge amounts of cash that can be won with the maximum payout being 9500 times your initial stake. Wizard Slots gives Double Up Ducks a 10/10. If you liked this game then why not also try our temple of isis slot.